Opportunities to study numerous areas of the law abound at the Sandra Day O'Connor College of Law. The college is home to centers and programs dedicated to the pursuit of new knowledge while honoring the traditions of the past. The College of Law at Arizona State University is a smaller law school with smaller classes where “you get a lot of personal attention.” At the same time, “The range of courses is extensive.” The Indian Legal Program here is one of the finest of its kind in the country. Another point of pride is the Center for Law, Science and Innovation, which—not very surprisingly—concentrates on the intersection between law and science. Hands-on opportunities to “get real-world experience in nearly any legal field” are abundant. Eleven clinics allow students “to employ lawyer[ing] skills instead of just talking about it or writing legal memos,” and virtually every student who wants to participate in a clinic can participate. There are “almost too many opportunities for externships” with judges, legislative offices, and administrative agencies, observes one awed student. The faculty at ASU is “a wide mix of both hardscrabble, old-school courtroom warriors, and young, innovative minds.” There are a lot of adjunct faculty members “who enjoy teach­ing and who bring real practical experience into the classroom” as well. Most professors are “very accessible and happy to help.” “They enjoy getting to know students outside of the classroom.” Inside the classroom, “professors use the Socratic Method mostly, but not in a scary way.” The focus is “more on teaching relevant materials than playing games with students.” “Although the material is sometimes as dry as the Arizona desert, the teachers do a great job [of] keeping the class interesting.” “I could not have asked for better professors my first semester,” beams a 1L. A few students tell us that the adminis­tration is “only concerned with raising ASU’s ranking” but the overwhelming sentiment is that with programs like the 3L Bar (taking the AZ bar exam in the 3rd year) and a new building in the works the top brass is “visionary” and “extremely responsive.” The law school staff as a whole is “totally” approachable and “wonderful to work with at every level” (though it’s a much different story when you are “forced to deal with the red tape of the general university”). Students here have “amazing access” to the Phoenix legal market and Career Services “will bend over back[ward] for you to help you make contacts in the job market.” Students also point out that for better or for worse, they are “bombarded with opportuni­ties to meet with practicing attorneys.” Opinions concerning the portability of an ASU degree are decidedly split, though. Some students say it’s very easy if you want to work in another state upon graduation. 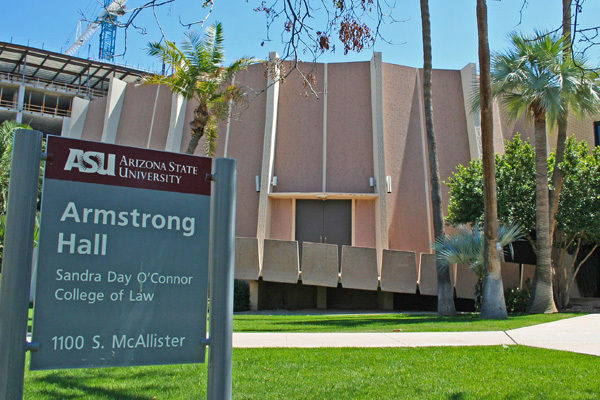 “ASU law degrees actually travel quite well and are respected throughout the United States,” boasts a confident 1L. Others disagree. “ASU is well-known in Arizona but needs to gain more national prominence,” they say. “If you want to work anywhere out of Arizona, the degree doesn’t travel well.” Some of ASU’s facilities are “old and outdated.” Though the school has recently reno­vated their classrooms and taken down “the paneling from the 1970s,” the “well-equipped” law library is “pretty nice,” though. It’s relatively new and “state-of-the-art in its technology and environment.” In addition to four floors of study space, there’s an all-night study room that allows students to come as late or early as they please and stay as long as they want. “I have never had a problem finding a quiet place to study,” notes a 1L. Description: A general program that focuses on law and legal issues from the perspective of the social sciences and humanities. JD/MBA; JD/MSW; JD/PhD Psychology; JD/PhD Justice & Social Inquiry; JD/MD with Mayo Clinic; Master of Legal Studies/Master of Accountancy; Master of Legal Studies/MBA; Master of Legal Studies/Master of Real Estate Development; Master of Legal Studies/Master of Taxation; Master of Legal Studies/Master of Science in Information Management; Master of Legal Studies/Master of Science in Management. Joe Sims - Partner, Jones Day, Washington, D.C.
Want more info about Arizona State University Sandra Day O'connor College of Law? Get free advice from education experts and Noodle community members.